This is the third in my favorite reads in 2014. View part 1, part 2, part 4, part 5, and my review of Gilead for the rest. This book was beautiful and sad and thought-provoking and wonderful. It shed light on gender roles and familial relationships and the way culture shapes our perception of the world around us. It could also very easily be called The Poisonwood Bible: How to be the Very Worst Missionary. It’s a story told by the wife and four daughters of Nathan Price, a Baptist missionary who takes his family to the Congo in 1950s. It takes place over three decades and covers the gradual undoing of the family during Nathan’s attempts at mission work. 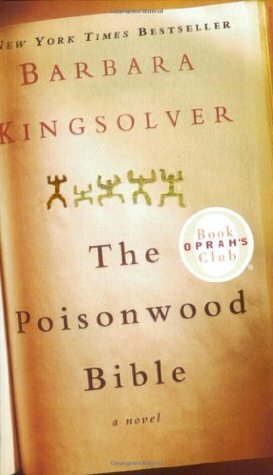 I was fully consumed by Kingsolver’s characters and prose. Each new perspective captures different elements of a complex narrative without losing touch with the larger story. However, I know that there a lot of people of faith who aggressively hate this book. It seems like most of the negative reviews for this book center on issues readers have with the presented worldview. I don’t get that as an argument for rejecting the entire book. Of course there are multiple sides to every story, of course the novel tells only a few facets of a vastly complex time in history. It also doesn’t reflect my personal views of faith. But I don’t think literature has to be an exact reflection of what I think and feel to be valuable. This book challenged me to think about how I approach social issues and communicating my beliefs to others. It’s also, by far, the best book I’ve read this year. Which brings up an important question, I guess, about how we as individuals approach literature. I’m not saying that there are no books I would be uncomfortable reading because of the subject matter. There are. But this one just wasn’t as offensive as some people (many that I hold in high regard) made it out to be. What do you think? Does a negative portrayal of something you love disqualify a book for you? If so, what works of fiction have gone too far? Or do you make it a point to intentionally read outside of your comfort zone/world view? Has a work of fiction radically altered how you see an alternative point of view?